Cambodia's history can be traced back to the Stone Age. 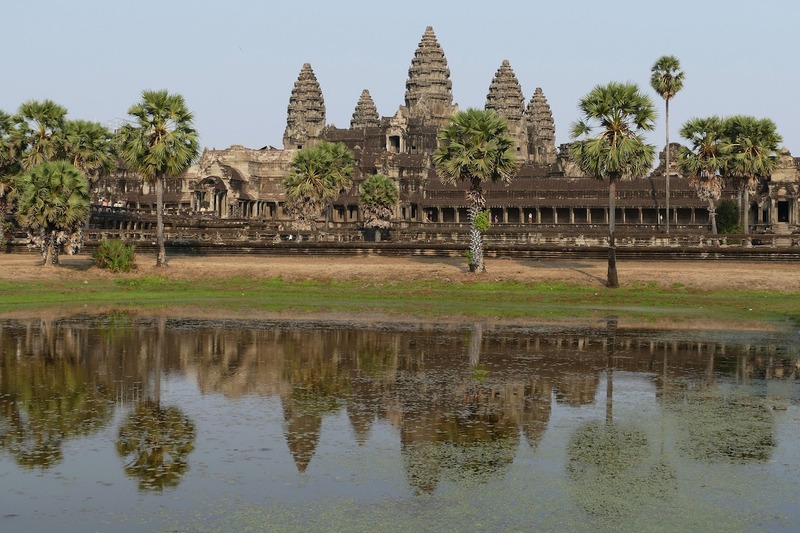 The Khmer people formed powerful kingdoms between the ninth and twelfth centuries, constructing a vast capital city and temple complex at Angkor, but their empire then declined and for 600 years Cambodia had feuds with Thailand and Vietnam. A French protectorate from the mid-19th century, Cambodia fell under Japanese authority during World War II, finally gaining independence from France in 1953. From 1955 to 1970 the Kingdom of Cambodia was ruled by Prince Norodom Sihanouk. Sihanouk had been king since 1941, but he abdicated in 1955 in order to further his aim to establish Cambodia as a constitutional monarchy. 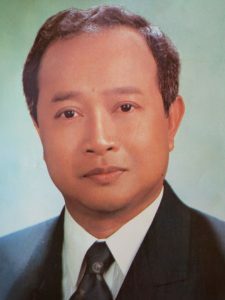 Sihanouk formed a political party, led it to victory and became Prime Minister. He was elected as Head of State in 1960. 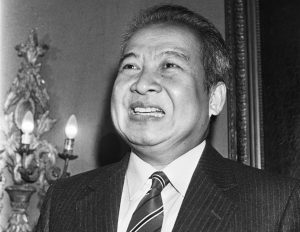 In 1963 left-wing opponents of Sihanouk (including Saloth Sar, who changed his name to Pol Pot) fled Phnom Penh, the capital, for the jungles and mountains of Cambodia and established the Communist Party of Kampuchea (the Khmer Rouge). In 1969 United States bombings of Cambodia began, largely in secret, aimed at Vietnamese communist base camps on Cambodian territory. Head of State, Prince Norodom Sihanouk, is deposed in a coup d'état led by General Lon Nol. 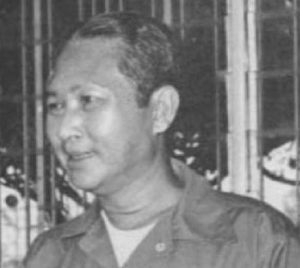 Sihanouk forms a United Front with his former enemies, the Khmer Rouge, to oppose the Lon Nol regime. US and South Vietnamese troops invade Cambodia, without Lon Nol's knowledge or approval, in order to attack communist bases. US troops withdraw after two months. Two million Cambodians are made homeless by escalating war between Lon Nol and the Khmer Rouge, led by Pol Pot. 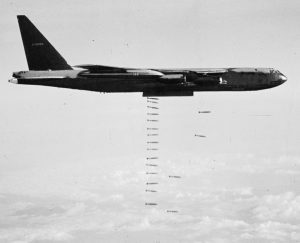 Massive US bombing raids in Cambodia are terminated by act of Congress. More than a million people and two-thirds of Cambodia's draught animals have been killed, wounded or maimed since bombing started in 1965. The US has dropped 2,756,941 tons of bombs, more than all the bombs dropped by the Allies during World War II, in 230,516 sorties on 113,716 sites. Nearly half the population have been uprooted and displaced within their own country. Lon Nol flees to Hawaii. On 17 April the Khmer Rouge enter Phnom Penh and establish the government of Democratic Kampuchea (DK). Entire populations of major cities are forced into hard labour in the countryside. The Cambodian holocaust begins. Sihanouk returns to Phnom Penh as Head of State. Sihanouk resigns and remains virtually under house arrest. Heavy fighting on the Kampuchea-Vietnam border begins when DK troops launch cross-border raids. Heng Samrin, a Khmer Rouge officer, and others stage an unsuccessful uprising against the Pol Pot regime, then flee to Vietnam. Vietnam invades Kampuchea on Christmas Day. 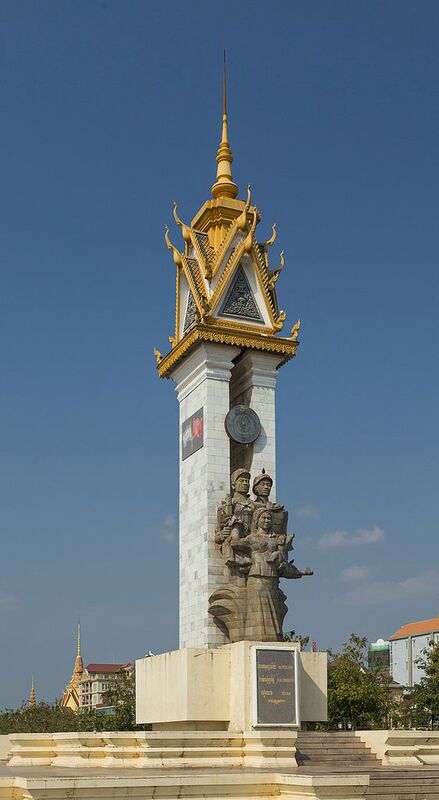 Phnom Penh is captured by the Vietnamese, who install Heng Samrin as President of the People's Republic of Kampuchea (PRK). The PRK is not recognised by the United Nations, and DK (still led by Pol Pot) occupies Cambodia's seat at the UN General Assembly. The Khmer Rouge are driven towards the Thai border. Conflict and famine cause Cambodians to flee to Thailand. 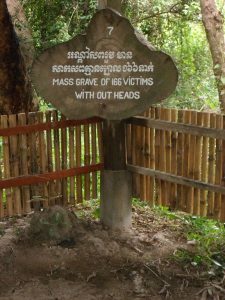 The extent of Khmer Rouge atrocities becomes evident: up to at least 1.7 million inhabitants have perished; Cambodia's infrastructure is in ruins — no currency, no financial institutions, no postal system, no telephones, virtually no sanitation, clean water or electricity; 45 doctors remain out of the 450 practising before 1975; 7,000 out of 20,000 teachers have survived; no schools; books burned. Chaos prevents normal rice planting: the 1979/80 harvest is only one third of the usual output. An international humanitarian relief effort is set up. Kampuchea's political isolation from the West continues. The Coalition Government of Democratic Kampuchea (CGDK) is formed between DK, the Khmer People's National Liberation Front (KPNLF - formed from the remnants of Lon Nol's government) and the Front Uni National pour un Cambodge Indépendant, Neutre, Pacifique, Economique et Coopératif [United Front for an Independent, Peaceful and Co-operative Cambodia] (FUNCINPEC - led by Sihanouk). The CGDK occupies Kampuchea's seat at the UN General Assembly. Member states of the United Nations declare the 'Kampuchean emergency' to be over, despite outspoken statements by the UN secretariat that it is not. Most UN donor governments impose a 'development aid' embargo on Kampuchea. Fighting between the PRK and DK drives more refugees into Thailand. DK forces begin to disperse and conduct guerrilla warfare over a wider area of Kampuchea. The PRK adopts a liberal democratic constitution and establishes the State of Cambodia with Hun Sen (an ex-Khmer Rouge officer who fled to Vietnam with Heng Samrin) as Prime Minister. Vietnamese troops withdraw. 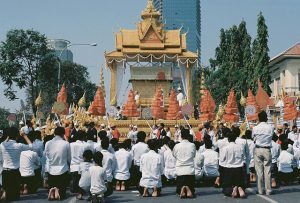 Buddhism is reinstated as the national religion. The Paris Peace Agreement is signed by all factions. A Supreme National Council is established with Prince Sihanouk as chairman. Political isolation ends. The United Nations Transitional Authority in Cambodia is established. Repatriation of 360,000 Cambodians in Thai border camps begins. The Khmer Rouge withdraw from the democratic process. Elections take place without Khmer Rouge participation. A coalition government is established, led by Prince Norodom Ranariddh (FUNCINPEC) and Hun Sen (Cambodian People's Party, formerly People's Revolutionary Party of Kampuchea) as First and Second Prime Ministers respectively. Cambodia becomes a constitutional monarchy with King Norodom Sihanouk as Head of State. The government is recognised internationally. 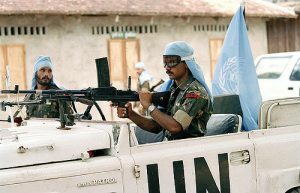 Fighting resumes between the government army and the Khmer Rouge. Division becomes increasingly evident in the coalition. Rumours of Pol Pot's death circulate. The Khmer Rouge splits into factions, some of which surrender to the Cambodian government. Pol Pot is captured by a faction of the Khmer Rouge. On the advice of his generals First Prime Minister Prince Norodom Ranariddh leaves Cambodia. Second Prime Minister Hun Sen accuses Ranariddh of collaborating with the Khmer Rouge and seizes control of the government after a brief military skirmish. Prince Norodom Ranariddh is found guilty of arms smuggling and collaborating with the Khmer Rouge, but he receives a royal pardon. As the Khmer Rouge disintegrates, losing more and more ground to government forces, Pol Pot dies of a heart attack. Four months after an inconclusive general election Hun Sen and Norodom Ranariddh conclude a power-sharing agreement. A measure of political stability returns to Cambodia, which is admitted to membership of the Association of South East Asian Nations (ASEAN). 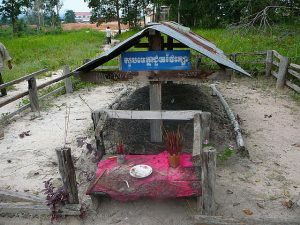 The remnant of the Khmer Rouge surrender. 347 people die, 318,000 homes are destroyed and two million people are affected in the worst flooding in Cambodia for 40 years. Cambodia successfully hosts the ASEAN Summit and ASEAN Tourism Forum. For the first time a senior Khmer Rouge leader is found guilty of a crime in a court of law (in connection with the kidnapping and murder of three Western backpackers in 1994). Relations between Cambodia and Thailand are strained after a mob burns down the Thai embassy in Phnom Penh and wrecks Thai-owned business premises. Cambodia is admitted to the World Trade Organisation. 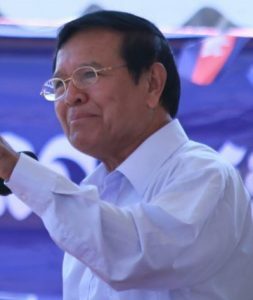 The Cambodian People's Party wins the most seats in a general election but not enough to form a government without a coalition partner. Eleven months after the 2003 general election the leaders of the Cambodian People's Party and FUNCINPEC finally agree on the formation of a coalition government. The National Assembly passes legislation to enable trials to take place of former Khmer Rouge leaders. King Norodom Sihanouk abdicates and is succeeded by his son Norodom Sihamoni. The National Assembly votes to remove parliamentary immunity from three opposition members. One is arrested and the other two, including Sam Rainsy, leader of the Sam Rainsy party, flee the country. The military court's jurisdiction is extended to cover any case "regarding the violation of people's security." Prime Minister Hun Sen sues several opponents for defamation (a criminal offence), while others leave the country, fearing arrest because of their opposition to a controversial border treaty with Vietnam. The Prime Minister drops charges for defamation and the King issues royal pardons, resulting in the release of those imprisoned in 2005 and the return to Cambodia of Sam Rainsy. The Extraordinary Chambers in the Courts of Cambodia for the Prosecution of Crimes Committed during the Period of Democratic Kampuchea begin preparations for a trial of former Khmer Rouge leaders. The constitution is amended to enable a party obtaining a simple majority at a general election to form a government. Prince Norodom Ranariddh is ousted from his position as head of FUNCINPEC and removed from his seat in the National Assembly. The Cambodian People's Party wins an overwhelming victory in elections for commune chiefs. Five former high-ranking officials of the Khmer Rouge are charged with crimes against humanity. The Cambodian economy enjoys a high growth rate with steadily increasing revenues in the garment and tourism industries. Revenue from offshore oil production is expected to make a significant contribution to the economy, peaking in 2021. In a general election, the Cambodian People's Party wins 90 seats in Cambodia's 123-seat National Assembly. Preliminary hearings take place in preparation for the trials of the five Khmer Rouge officials held in custody. Cambodian and Thai troops facing off along a disputed border near the Preah Vihear temple, which had recently been listed as a World Heritage site, exchange fire. Consumer price inflation hits 22%. 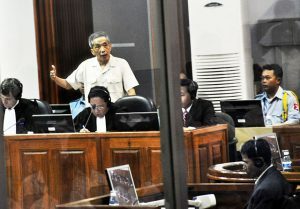 The trial of former Khmer Rouge prison director Kaing Khek Ieu (also known as Duch) takes place in the Extraordinary Chambers in the Courts of Cambodia for the Prosecution of Crimes Committed during the Period of Democratic Kampuchea. Diplomatic relations between Cambodia and Thailand deteriorate further when Cambodia's Prime Minister offers fugitive former Thai premier Thaksin Shinawatra a job as an economic adviser. Cambodian and Thai troops again exchange fire in the disputed border territory near the Preah Vihear temple. Kaing Khek Ieu is found guilty of war crimes and crimes against humanity and is sentenced to 35 years in prison, but the sentence is reduced by 16 years to take account of his pre-trial detention and co-operation with the court. Approximately 350 people die and 400 are injured in a stampede in Phnom Penh. The trial of four Khmer Rouge leaders, Nuon Chea ('Brother No. 2'), Khieu Samphan (head of state), Ieng Sary (foreign minister) and his wife Ieng Thirith (social affairs minister, later declared unfit to stand trial) begins. The International Court of Justice establishes a demilitarised zone around the Preah Vihear temple. Former King Norodom Sihanouk dies. The trial of increasingly frail Nuon Chea, Khieu Samphan and Ieng Sary continues. President Obama makes the first ever visit by a United States president to Cambodia. Protests, some violent, against land evictions take place. After being granted a royal pardon for a court conviction, exiled Cambodia National Rescue Party (CNRP) leader Sam Rainsy returns to lead his party in the strongest challenge yet to the rule of the Cambodian People's Party. Following disputed general election results, CNRP National Assembly members refuse to take their seats and large-scale protest rallies are held. Garment factory workers demanding higher wages swell the protesters' numbers and there are violent clashes with riot police. Ieng Sary dies and the first stage of the trial of Nuon Chea and Khieu Samphan concludes. An agreement between the Cambodia National Rescue Party (CNRP) and the Cambodian People's Party leads to CNRP National Assembly members occupying their seats. Nuon Chea and Khieu Samphan are found guilty of crimes against humanity and are sentenced to life imprisonment. The second stage of their trial begins. 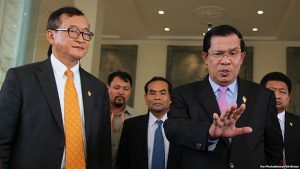 The relationship between the Cambodian People's Party (CPP) and the Cambodia National Rescue Party (CNRP) becomes increasingly sour: CNRP president Sam Rainsy is removed from the National Assembly and ends the year in exile again, and two CNRP National Assembly members are beaten unconscious by protesters. A controversial law regulating non-governmental organisations is enacted. Cambodia opens its doors to refugees previously held by Australia on Nauru but few agree to settle there. The Khmer Rouge trials continue. The CNRP boycotts the National Assembly for six months, Sam Rainsy is sentenced in absentia to five years' imprisonment, several opposition figures are jailed and Kem Sokha, deputy leader of the CNRP, is holed up in his party headquarters for five months. Sam Rainsy resigns as leader of the CNRP when a new law permits the dissolution of parties whose leaders have criminal convictions. Kem Sokha is appointed leader of the CNRP but is later arrested on a charge of treason. Two independent radio stations and an English-language newspaper are shut down. 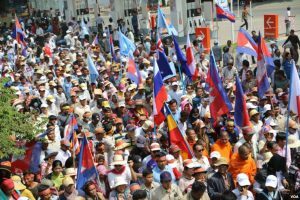 The Supreme Court forces the CNRP to close because of its alleged attempts to stage a foreign-backed “colour revolution”, and its seats in the National Assembly are redistributed to other parties. Prime Minister Hun Sen states his intention to stand for election for two more mandates (2018 to 2028). A second trial of Khmer Rouge leaders Khieu Samphan and Nuon Chea concludes. The constitution is amended to forbid political parties from jeopardising the interests of Cambodia. A new law makes insulting the King a criminal offence. The CPP wins every seat in the National Assembly at a general election. Kem Sokha is released from prison after more than a year in pre-trial detention but is confined to his home. At the conclusion of the second stage of their trial on charges of genocide and crimes against humanity Nuon Chea and Khieu Samphan are found guilty and are sentenced to life imprisonment. Cambodia's recovery from the effects of war, genocide and the virtual elimination of its skilled workforce has been slow. 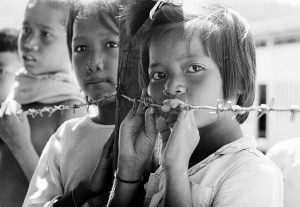 International isolation, the Khmer Rouge guerrilla campaign against the government in the 1980s and early 1990s, political instability, corruption and natural disasters have all hindered development. The growth of the tourism and garment industries, providing Cambodia with much needed foreign investment, and the reduction in the HIV/AIDS infection rate have been two bright spots in an otherwise gloomy picture. Cambodia has seen improvements in health (such as a reduction in maternal mortality), education (for example, higher rates of literacy), transport (more paved roads) and communications (growth in mobile phone and Internet use). However, the wide disparity between the rising urban middle class and the rural poor remains.